Latest news: Arunachal Pradesh State Council for Technical Education has declared APJEE Result 2015 on 31st May 2015 on official website www.apdhte.nic.in for getting admission degree and diploma courses (technical & professional courses) against the seats made available to the State by the Govt. of India, the North Eastern Council and also in the colleges in the State. 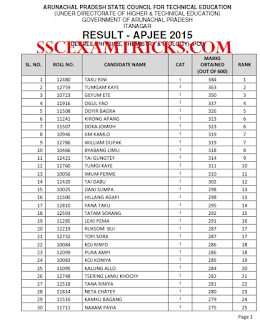 APJEE result 2015 contains merit list of candidates with marks obtained (out of 300) on official website. A huge numbers of candidates had appeared in Arunachal Pradesh Joint Entrance Exam 2015 for admission in Degree (PCB) & Diploma courses. These candidates can download AP Joint Entrance Exam 2015 result from the direct link provided below. APJEE had successfully conducted on 30th April 2015 in two shifts. First shift was for APJEE 2015 Degree course which was held from 09:00 AM to 12:00 Noon and second shift was for APJEE 2015 Diploma Courses which was held from 02:00 PM to 04:00 PM at various centres in Itanagar, Naharlagun and Nirjuli. APJEE 2015 Entrance Exam was conducted by pen mode. It was an objective type entrance exam in which question paper containing multiple choice question. APJEE 2015 Entrance Exam contained four options as answer in which candidates were required to select one correct answer. Earlier Arunachal Pradesh State Council for Technical Education had invited offline and online application for registration from 18th February 2015 to 17th April 2015. A huge numbers of candidates had appeared in this written examination. APJEE 2015 Entrance Examination was held on 30th May 2015 at various centres. These candidates are waiting for their APJEE 2015 result. 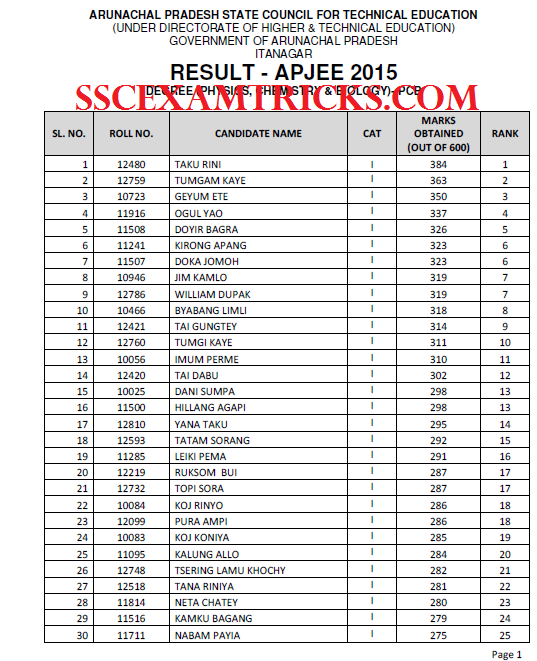 The latest news is that APSCTE has declared APJEE 2015 result on 31st May 2015 on official website. Those candidates who had appeared in this written examination and waiting for their result, they can download their online result / scorecards/ marks details from the direct link provided on this page. · APJEE 2015 result will be displayed in PDF. · Save and print the APJEE 2015 result Hard Copy for appearing in counseling for admission in College. · Original Marks Card/ Pass Certificate of the qualifying examination. · Certificate to ascertain the category of the candidate (ST Certificate for Cat.-I, Employment Certificate from respective employers or Domicile Certificate issued by First Class Magistrate during 2015 for Cat.-II). · Certificate issued by First Class Magistrate during 2015 for Category-II.